This is an excellent and informative site that unravels the myths and misconceptions surrounding copyright. You may want to read this excellent article, The Promise of a Post-Copyright World. Shout! Factory have been doing the best job they can in releasing their SCTV DVD's up to this point. Now the fans can get involved and let the Copyright Holders know that they are missing an opportunity to allow their music to be used on the SCTV DVD's. Visit Shout! Factory and find out more about the current DVD releases. Don't forget to pick up the SCTV: Best of the Early Years on October 24, 2006! 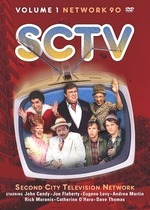 SCTV on DVD Campaign Blog! I have completely revised and updated my Blogger. This is another way to spread the word for the campaign! I am sure many SCTV fans remember the series Moonlighting. However, what many of you may not know is that a major fan campaign was started to see to it that Moonlighting was released on DVD, complete and uncut! Now, if we as fans of SCTV could start a campaign like this one, then maybe we could actually see all of the music restored to SCTV!